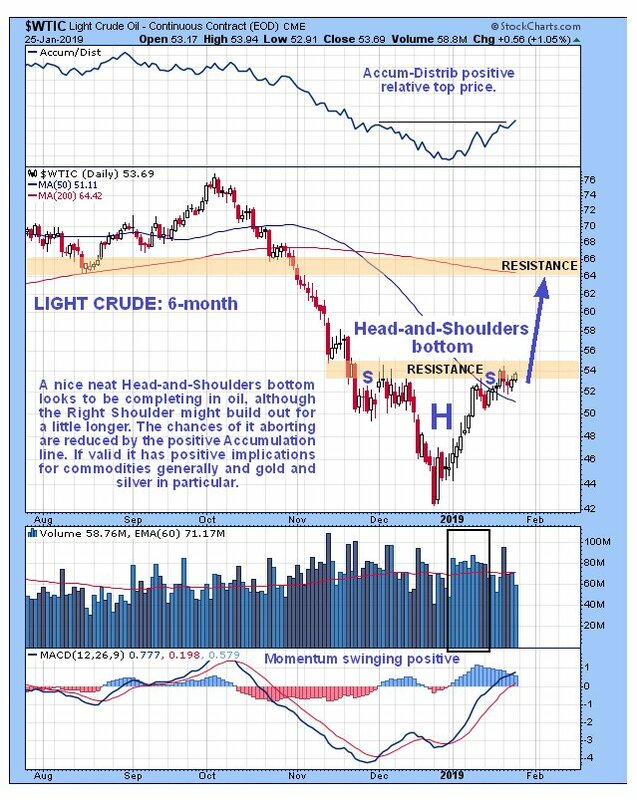 It has been observed that a nice neat Head-and-Shoulders bottom appears to be completing in oil, which we can clearly see on the 6-month chart for Light Crude shown below. While it looks like it could use a bit more time building out the Right Shoulder of the pattern, which might involve a near-term dip back to about $50, it could break higher at any time. Once it does we can expect a fairly swift move to the resistance in the $64 - $66 zone. If oil does break higher here or soon it will have positive implications for commodities generally and for the Precious Metals in particular, and this helps to explain the strength in gold and silver on Friday soon after Big Money engineered a false breakdown from their respective bull Pennants in order to freak out the little guy and scoop up some of his holdings on the cheap. By the way, they did the same with Tanzanian Royalty not long ago, but they didn’t fool us. 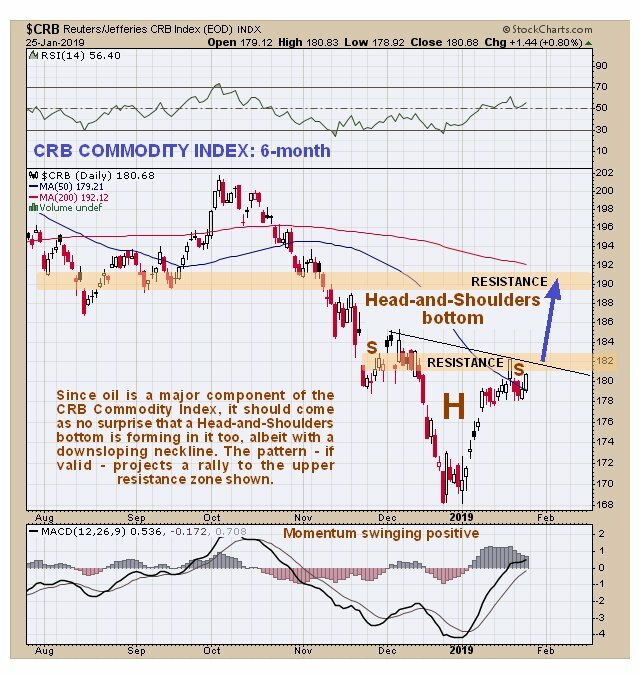 Thus it comes as no surprise that a similar Head-and-Shoulders bottom appears to be completing in the CRB Commodity Index, albeit with a downsloping neckline, that, if valid – and remember the Accumulation line in oil suggests that it is valid – projects a rally to the upper resistance level shown in the 190 – 191 area, which will clearly have a bullish influence on the Precious Metals. Again, it could back off short-term towards about 176 to complete the Right Shoulder low before breaking out, but could break out at any time now. What we are seeing here could have implications for the broad stockmarket and we will take a look at that separately later. Posted at 2.50 pm EST on 27th January 19.